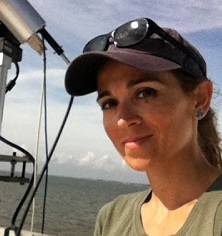 Dr. Maria Tzortziou leads a multidisciplinary research and teaching program in land-ocean-atmosphere interactions and exchanges, air-quality, coastal and estuarine biogeochemistry, impacts of coastal urbanization and climate extremes on nearshore ecosystem processes and natural resources. A central aspect in her research is the integration of enhanced remote sensing tools with sophisticated models for assessing coastal vulnerability and predicting ecosystem responses, feedbacks and resilience to environmental change. Dr. Tzortziou is a member of five international science working groups to build a coordinated program on water cycle, atmospheric chemistry and impacts on coastal ecosystems in the Mediterranean. She is a member of the Ocean Science and Atmospheric Science Working Groups for NASA's Decadal Survey satellite mission GEO-CAPE, and Co-Lead of the GEO-CAPE Interdisciplinary Science Working Group to investigate how satellite observations from a geostationary orbit can advance interdisciplinary science relevant to the biogeochemical coupling between the atmosphere, ocean and terrestrial (including human) components of the Earth System. Dr. Tzortziou is the Applications Coordinator (DPA) for NASA's Decadal Survey satellite missions GEO-CAPE and ACE (Aerosol, Clouds and ocean Ecosystems), and the Climate Initiative satellite mission PACE (Pre- Aerosol, Clouds and ocean Ecosystems), leading activities to maximize the applications value and societal benefits of these new observations from space. Land-ocean-atmosphere interactions and exchanges across temporal and spatial scales; Impacts (and feedbacks) of environmental change (e.g., increasing coastal urbanization, anthropogenic air-pollution, increased atmospheric CO2, nutrient enrichment, sea level rise, and changes in the frequency and severity of weather extremes) on coastal ecosystem processes, functioning and servicesRemote sensing retrieval of biogeochemical variables in estuarine and coastal regions; Underwater radiative transfer modeling; Satellite and ground-based UV remote sensing and inversion algorithms for tropospheric air quality; Space-based remote sensing applications to coastal resource management. Tzortziou M., J. R Herman, Z. Ahmad, *C.P. Loughner, N. Abuhassan, A. Cede, 2014, "Atmospheric NO2 Dynamics and Impact on Ocean Color Retrievals in Urban Nearshore Regions", Journal of Geophysical Research-Oceans. DOI: 10.1002/2014JC009803. lZeri C., * E. Pitta, M. Tzortziou, E. Dimitriou, V. Paraskevopoulou, E. Dassenakis, M. Scoullos, 2014, "The role of dissolved organic matter cycling in E. Mediterranean rivers experiencing multiple pressures. The case of the transboundary river Evros", Mediterranean Marine Science, Accepted for publication. l*Loughner, C., M. Tzortziou, M. Follette-Cook, K. Pickering, D. Goldberg, C. Satam, A. Weinheimer, J. Crawford, D. Knapp, D. Montzka, G. Diskin, and R.R. Dickerson. 2014. Impact of bay breeze circulations on surface air quality and boundary layer export, Journal of Applied Meteorology and Climatology, 53, 1697-1713, doi:10.1175/JAMC-D-13-0323.1. l*Goldberg DL,* CP Loughner, M Tzortziou, JW. Stehr, KE Pickering, L Tambaoga Marufu, and R Dickerson, 2014, Higher surface ozone concentrations over the Chesapeake Bay than over the adjacent land: Observations and models from the DISCOVER-AQ and CBODAQ campaigns, Atmospheric Environment 84, 9-19.
l *He H., *CP Loughner, JW Stehr, HL Arkinson, L Brent, M Follette-Cook, M Tzortziou, KE Pickering, A Thompson, DK Martins, GS Diskin, BE Anderson, JH Crawford, AJ Weinheimer, P Lee, JC Hains, and R Dickerson, 2014, "An elevated reservoir of air pollutants observed over the Mid-Atlantic States during the 2011 DISCOVER-AQ campaign: a case study from airborne measurements and numerical simulations", Atmospheric Environment 85, 18-30.
lFishman J, LT Iraci, (co-authors in alphabetical order), J Al-Saadi, P Bontempi, K Chance, F Chavez, M Chin, P Coble, C Davis, P DiGiacomo, D Edwards, A Eldering, J Goes, J Herman, C Hu, D Jacob, C Jordan, S R Kawa, R Key, X Liu, S Lohrenz, A Mannino, V Natraj, D Neil, J Neu, M Newchurch, K Pickering, J Salisbury, H Sosik, A Subramaniam, M Tzortziou, J Wang, M Wang, 2012, "The United States' Next Generation of Atmospheric Composition and Coastal Ecosystem Measurements: NASA's Geostationary Coastal and Air Pollution Events (GEO APE) Mission", Bulletin of the American Meteorological Society. DOI:10.1175/BAMS-D-11-00201.1 (Article appeared on the Journal's front cover page). lDimitriou E., *Mentzafou A., *Markogianni V, Tzortziou M., and Zeri C., 2012, "Geospatial Investigation into Groundwater Pollution and Water Quality Supported by Satellite Data: A Case Study from the Evros River (Eastern Mediterranean)", Pure Applied Geophysics, DOI: 10.1007/s00024-012-0621-2. lTzortziou M., P. J. Neale, J. P. Megonigal, *C. Lee Pow, and *M. Butterworth, 2011, "Spatial gradients in dissolved carbon due to tidal marsh outwelling into a Chesapeake Bay estuary", Marine Ecology Progress Series, 426, 41-56, DOI: 10.3354/meps09017. lHerman J., A. Cede, *E. Spinei, G. Mount, M. Tzortziou, N. Abuhassan, 2009, "NO2 Column Amounts from Ground-based Pandora and MFDOAS Spectrometers using the Direct-Sun DOAS Technique: Inter-comparisons and Application to OMI Validation", Journal of Geophysical Research, 114, DOI:10.1029/2009JD011848, 2009.
l Tzortziou M.,N.A. Krotkov, A.Cede, J. R. Herman, A. Vassilkov. 2008, "A new technique for retrieval of tropospheric and stratospheric ozone profiles using sky radiance measurements at multiple view angles - Application to a Brewer spectrometer." Journal of Geophysical Research-Atmospheres, 113, D06304, DOI:10.1029/2007JD009093. l Tzortziou M., C. Osburn, and P.Neale, 2007. "Photobleaching of dissolved organic material from a tidal marsh-estuarine system of the Chesapeake Bay", Photochemistry and Photobiology, 83: 782-792. DOI: 10.1111 ⁄ j.1751-1097.2007.00142.x (Article appeared on the Journal's front cover page). lAhmad Z, C.R. McClain, J.R. Herman, B. Franz, E. Kwiatkowska, W. Robinson, E.J. Bucsela, M. Tzortziou, 2007. "Atmospheric correction for NO2 absorption in retrieving water-leaving reflectances from the SeaWiFS and MODIS measurements". Applied Optics, 46(26): DOI: 10.1364/AO.46.006504 (Article appeared on the Journal's front cover page). 2014 - present: "Tidal wetlands as sources and sinks of carbon in a changing world: Remote Sensing, Measurements and Modeling of Wetland-Ocean-Atmosphere Interactions", NASA/USDA/DOE/NOAA Carbon Cycle Science Program. Lead PI: M. Tzortziou. 2014 - present: "The carbon budget of tidal wetlands and estuaries of the contiguous United States: a synthesis approach". NASA/USDA/DOE/NOAA Carbon Cycle Science Program. Co-PI/Institution Lead PI: M. Tzortziou. 2014 - present: "Application of existing and new high-resolution, hyper-spectral observations in the UV-NIR to assess GEO-CAPE measurement and instrument requirements for capturing CDOM and DOC short-term & small scale dynamics and understanding impacts of O3 and NO2 on GEO-CAPE ocean color retrievals", NASA Ocean Biology and Biogeochemistry Program. Lead PI: M. Tzortziou. 2014 - present: "Land-Ocean Interactions in the Arctic: An Integrative Field Campaign to Assess the Impacts of Natural- and Anthropogenic Changes to Coastal Ocean Biology, Biogeochemistry and Biodiversity", NASA Ocean Biology and Biogeochemistry Program. Co-PI/Institution Lead PI: M. Tzortziou. 2013 - present: "Use of the Pandora Spectrometer Network to Measure Short- and Long-Term Changes in Ozone Altitude Profiles and Column Amounts of O3 and NO2 for Satellite Validation (OMI, MLS, OMPS) and NASA Field Campaigns", NASA Science Mission Directorate, Atmospheric Composition: Upper Atmospheric Composition Observations Program. Co-PI/Institution Lead PI: M. Tzortziou. 2013 - present: "Refining requirements for aerosol and trace gas retrievals necessary for ocean color atmospheric corrections from a geostationary platform". NASA OBB Program. Lead PI: M. Tzortziou. 2013 - present: "Capturing CDOM and DOC short-term and small-scale dynamics in highly vulnerable coastal ecosystems". NASA Ocean Biology and Biogeochemistry Program. Lead PI: M. Tzortziou. 2012 - present: "Pre-Aerosol Clouds and Ecosystems NASA Mission - Applications ", NASA Science Mission Directorate, Research Opportunities in Space and Earth Sciences. Lead PI: M. Tzortziou. 2012 - present: "AegeanMarTech - Technological and oceanographic cooperation Network for the Study of mechanisms fertilizing the North-East Aegean Sea", European Commission. Co-I: M. Tzortziou. 2010 - present: "Spatial and Temporal Variability of Atmospheric NO2 and Other Trace Gases and Aerosols Over Eastern US Coastal Regions: Applications to Remote Sensing Observations and Studies of Nitrogen Deposition", NASA Science Mission Directorate, Research Opportunities in Space and Earth Sciences, New Investigator Award. Lead PI: M. Tzortziou. 2011 - present: "Retrievals of Trace gases from the Pandora Spectrometers and Applications to Atmospheric Correction of Coastal Ocean Color from a Geostationary Platform", NASA Science Mission Directorate, Research Opportunities in Space and Earth Sciences. Lead PI: M. Tzortziou. 2011 - present: "Understanding and Forecasting Impacts of Climate Change and Land Use on Terrestrial Carbon Fluxes in Coastal Watersheds", U.S. Geological Survey (USGS) and NASA, Research Opportunities in Space and Earth Sciences, Carbon Cycle Science. Science co-PI: M. Tzortziou.